Forget Me Not Designs Co. is a brand for calligraphy and artwork to immortalize inspiring thoughts into art or through calligraphy. We create hand-painted designs for our stationery which are customizable. We want to encourage people to create memories that they should never forget and to relive the days when handwritten notes is more popular than text messages. We facilitate workshops for youngsters who would like to explore their creative side and be comfortable with it. We want to promote therapeutic art in this ever busy world we are in and find refuge in beauty of self-expression. I’ve always loved handcrafted items so anything handmade makes my heart happy. Writing is also one of my favorite. I usually create something for dear friends to show them how much I love them. I am at my happiest seeing how excited they were to receive something that I created. When I served my volunteer work in the southern part of the country as a missionary, creating cards, bookmarks and other pretty stuff excites me. It is my way of ministering to my fellowmen. I discovered my passion in calligraphy after coping up with grief of the passing of my grandfather and from there I began my journey to learning more about calligraphy. 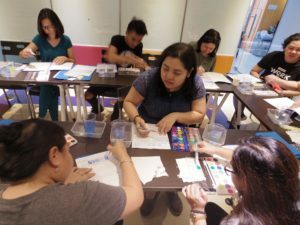 There is no doubt that the greatest love team in the world is Calligraphy and Crafting! What decided you to pursue this business? It started as a hobby because my main purpose is to cheer other people up with my creation until an unexpected plot twist came, I had to decide whether I should stay in employment or try something else. I prayed in the temple about what I should do because I felt I really had nowhere to go. Pursuing my passion into business is the answer I received which I find rather odd. I even questioned why because I did not believe I could do it. In hindsight, it all made sense. There is a reason for every answer we receive from heaven and we must obey. What were some challenges you encountered when you were starting out and how did you overcome it? Self-doubt is number 1. Although self-expression is the reason we started this business, self-doubt is the greatest enemy that ever existed. This is the very reason why there is a great struggle in creating something new whether it be painting or calligraphy. The motivation should be intrinsic so nothing could really stop you from going. Another struggle is finances. Bigger projects require more materials, machines and even manpower. It is very important to have mentors to understand how the industry is like and how to create your game plan. It is indeed true that if your passion doesn’t profit it is not a business but only a hobby. I do not want to stay in the hobby section so I had to step up and attended a lot of workshops, enrolled in business courses and had a lot of mentors to keep me going. Was it worth it pursuing your dream? It is absolutely worth every sleepless nights. The fulfillment we feel every time someone gives feedback of how they loved our items but most especially how it made them remember of wonderful memories they had back in the day, makes me feel like I am a fairy godmother helping them to always remember and never forget to create memories they could keep all their lives. Every time a participant of our workshop expresses how happy they are in finding an avenue to express themselves and how excited they are to continue what they started makes my heart full. Always make sure you know your VISION. Clarity is essential to move to the direction you want to go. Look for people who got crazy dreams and ideas like you, most likely they will be instruments to help you achieve your dreams like The Fulfilled Women. Is there anyone you look up to? I look up to a lot of women but one of the most influential in my life is Viviene Vargas. It is because of her that the little dreamer in me woke up and started working towards making them a reality. She believed in me like she saw something I couldn’t. It is through her that the answer the Lord gave me was triggered to come true. How has The Fulfilled Women Exclusive helped or inspired you in your journey? TFW Exclusive is a group of like minded women who are focused in achieving their goals. With their help, I learned to keep going because they encourage me to never give up. They are my support system and new ideas are shared which helped me in new opportunities. Member Spotlight features the members of The Fulfilled Women Exclusive where they share how their passion project has started and became a significant part of their lives now.